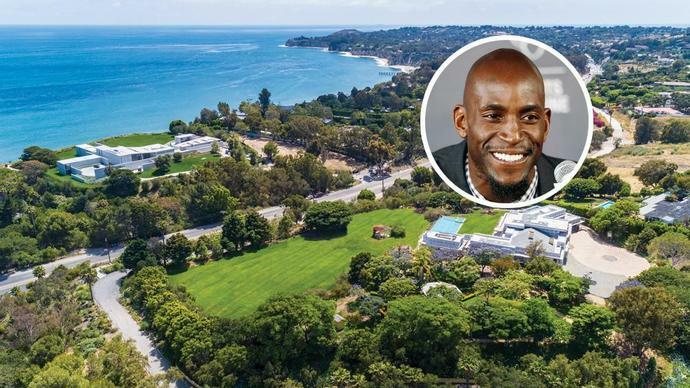 Retired NBA star Kevin Garnett is asking nearly $20 million for an unfinished mansion on seven prime ocean-view acres in Malibu. The seven-foot-tall, 15-time All-Star power forward, who played a dozen seasons with the Minnesota Timberwolves before he was traded to the Boston Celtics in 2007, acquired the posh spread in 2003 for $6.4 million. At the time of his purchase, a lavishly appointed Palladian-style villa of more than 8,000 square feet stood on the property; that has since been replaced with a still-under-construction contemporary behemoth that measures in at around 11,000 square feet, according to marketing materials, with active plans, permits and Coastal Commission approval in place that allow a buyer to expeditiously complete the build-out and choose interior finishes. Spread across three parcels that comprise a broad promontory above prestigious Paradise Cove, the sprawling estate is accessed by a gated and tree-lined driveway that makes a long sweep around the property to a parking-lot sized motor court which spreads out in front of the still scaffolding-surrounded mansion. Perched on a high point that affords over-the-tree-tops ocean views, the main house and detached guesthouse sit amid tree-shaded gardens that include a great sweep of sloping lawn with a huge, infinity-edged swimming pool and spa and an octagonal pavilion at the center of a star-shaped formal garden lined with clipped boxwoods. Garnett, who retired in 2016 and played his last two seasons for the Timberwolves, continues to own an 11,000-square-foot contemporary on an ultra-private lakefront peninsula of almost 7.5 acres in the wealthy suburbs about 20 miles west of downtown Minneapolis, which he picked up in late 2006 for $6.45 million. The Boston Celtics moved 2-0 up against the Indiana Pacers in their NBA playoff series.